Are you looking for a memorable team building activity? Or did you want to take out your clients and leave a memorable impression on them? 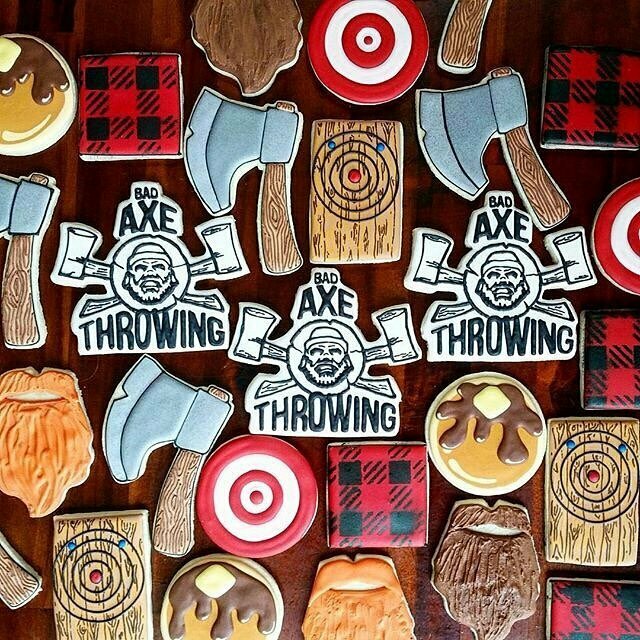 Bad Axe Throwing is the perfect venue to host all your corporate event needs. Regardless of your age, skills or fitness level, our axe throwing coaches teach you how to throw an axe for a fun, exciting & memorable experience. Event organizers frequently come to us to book their unforgettable experience. People are always looking to try something new, cool and different. We fit that description. We were even awarded the Certificate of Excellence by TripAdvisor and are ranked as the #1 destination in fun & games on TripAdvisor in Canada’s biggest city, Toronto. 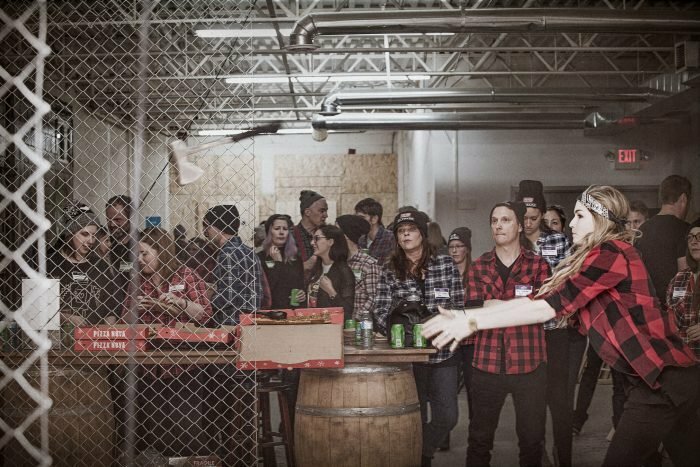 We’ve hosted axe throwing corporate events for companies like: Scotiabank, Ogilvy, Purolator, Sun Life Financial, Bank of America, UBER, Basecamp, and countless other large and small businesses. We even have recurring events with companies who bring their clients when they are in town. With your corporate booking, there’s no extra charge for catering in food or bringing your own drinks. If you would like suggestions on catering companies we recommend or have worked with in the past, we’re more than happy to help with the arrangements. A perfect example are these custom cookies (see pic above) we had made for a client in Toronto. You can also come in early if you need to set anything up or require early access to the space to ensure delivery of your food or any other items being delivered. Corporate & team building events last anywhere in between 2.5 to 3 hours. 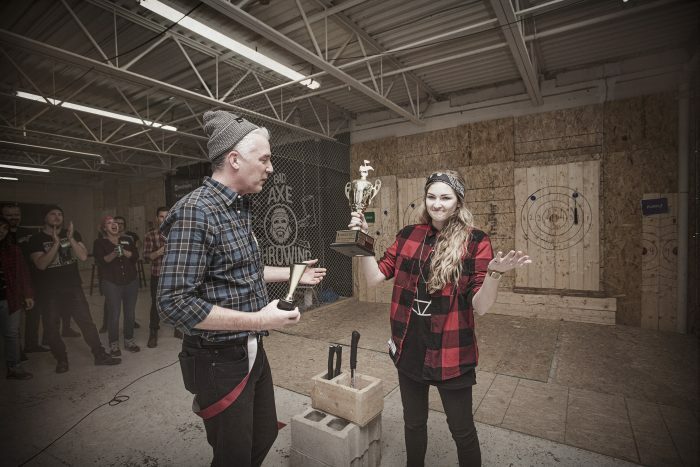 During this time you’ll have a dedicated axe throwing coach (or several coaches for larger groups) that will walk you through the rules, how axe throwing works, and then begin with practicing and teaching you how to throw an axe. 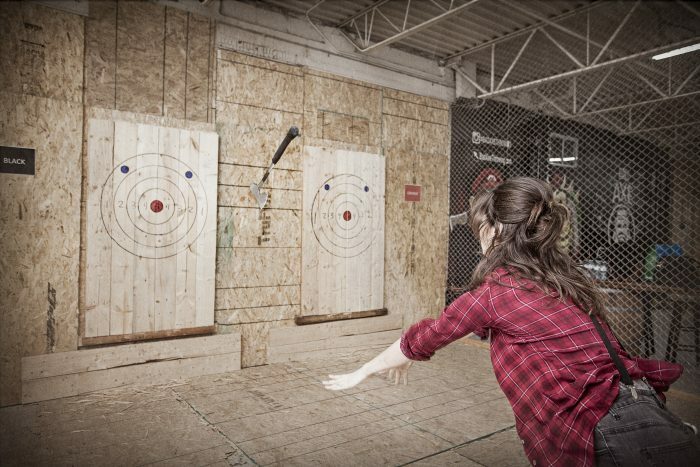 You will have dedicated axe throwing lanes where you will practice axe throwing. Once you’ve learned the technique, we separate people into teams and host a team-based tournament to crown a winning team. After the team tournament, if time permits, we also host an individual tournament where it’s every man/woman for themselves – where we enter into a final elimination rounds to crown the axe throwing champion within your company. We’ll make your corporate event completely stress free. If you have any special requests or would like any more information, please don’t hesitate to contact us. The most popular times for corporate events are during the week but if you’d like a booking on a weekend, please let us know as soon as possible as times do fill up fast so don’t forget to book your axe throwing event today. Hi, I have a team of 8 sales reps and I would like to do a team building/party with. We work in Burlington, wondering if this would be a unique idea. Absolutely – we have A LOT of corporate events. Most companies choose to visit us because it’s fun/engaging/different. It’s also great because we have different team challenges. Your group will have a great time axe throwing. We’ll reach out to you with more details. We are having a our yearly sales meeting in Burlington and I realize it is short notice but would you be able to accommodate a group of 35 people on Monday May 8th at 5:30 or 6PM? Please let me know either way. Thank you! Happy to hear that Russ was able to book your team in. Look forward to having you all in!